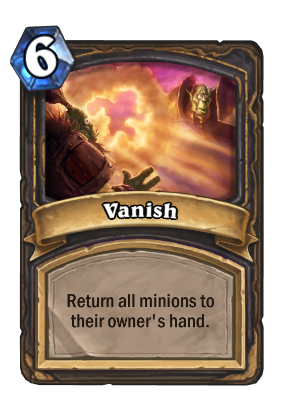 I hate this card for one reason, and one reason alone: Inconsistency. 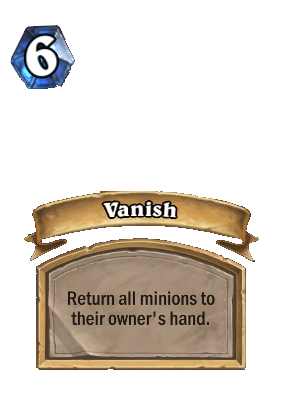 If your opponent's hand is almost full and has a view minions on the board, when this card gets played, the cards that get bounced back and the ones that die are random. So sometimes a Deathrattle minion would die, other times it wouldn't. You understand where I'm getting at? So why can't it be changed so the minions that get bounced back are prioritized from left to right? I refreshed the page to see if my internet sucked.... I haz beenz trollzed. Love the flavor text for this card.